Cestrum nocturnum commonly known as queen of the night, is a popular ornamental species widely distributed for its strongly fragrant flowers that bloom at night. Having bird-dispersed seeds and the ability to reproduce vegetatively has resulted in escapes from cultivation, where in some areas it aggressively colonises disturbed sites such as road edges and forest gaps forming dense impenetrable thickets and resulting in competition with and displacement of native plant species. C. nocturnum is also known to be poisonous if ingested, forming a risk to grazing livestock and has been known to produce hay-fever like symptoms in some people. Cestrum nocturnum is a glabrous shrub that grows from 1 to 5 m tall (depending on location) with ovate-oblong, petiolate, and obtuse leaves mostly 7 - 20 cm long (Webb et al., 1988; Tharman et al., 1994; Zhang et al., 1994). It has cymose racemes which are longer than the petiole and flowers that are greenish-white or pale greenish-yellow that emit a strong sweet fragrance at night (Webb et al., 1988; Tharman et al., 1994). The flowers of C. nocturnum have a green, 5-toothed, calyx about 1/3 as long as the 2.0 - 2.5 cm corolla which has obtuse, erect or spreading lobes which are 5-6 mm long (Tharman et al., 1994). The flower also includes 5 stamens which are puberulent at their bases (Tharman et al., 1994). 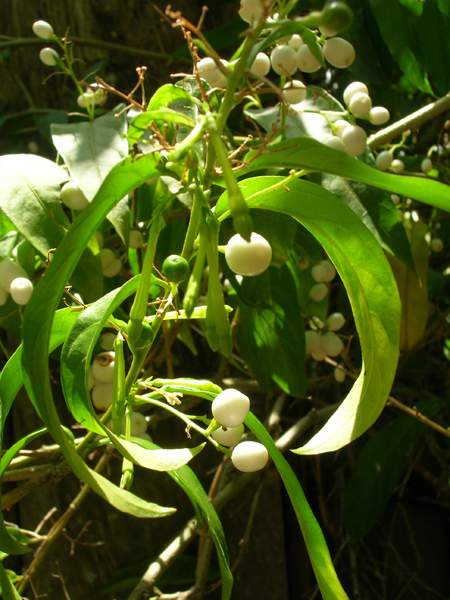 C. nocturnum produces small white berries about 8-10 mm long, with 1 - 3 seeds capable of being dispersed by birds (Tharman et al., 1994). Cestrum nocturnum is commonly cultivated in many countries as an ornamental plant due to its fragrant flowers that bloom at night (Tharman et al., 1994; Vander Velde, 2003; Starr et al., 2005). Cestrum nocturnum is often cultivated as an ornamental plant in gardens (Tharman et al., 1994; Vander Velde, 2003; Starr et al., 2005). Escapes are possible and can result in the establishment of dense, impenetrable thickets in scrub (Meyer et al., 1988), moist or wet forests including riparian zones (Oppenheimer, 2007), secondary forests and dense lowland forests (Meyer, 2000) as well as open areas, both natural and disturbed (Webb et al., 1988). C. nocturnum is also known as an aggressive invader of disturbed sites such as trailsides, forest gaps and landslides (Meyer, 2004). Cestrum nocturnum produces small white berries about 8-10 mm long, with 1 - 3 seeds capable of being dispersed by birds (Tharman et al., 1994). Seeds are produced after 18 months of establishment and can remain dormant in the soil for many years (Williams, 2008). Vegetative reproduction is also possible from cut roots or buds from creeping roots (Williams, 2008). 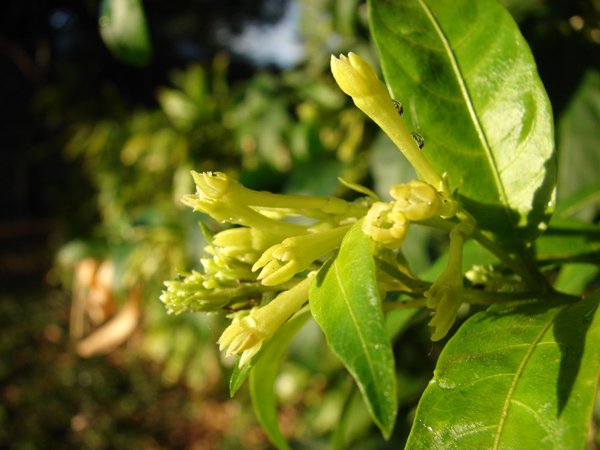 Recommended citation: Global Invasive Species Database (2019) Species profile: Cestrum nocturnum. Downloaded from http://193.206.192.138/gisd/species.php?sc=851 on 26-04-2019. Cestrum nocturnum is known to aggressively colonise disturbed areas (Meyer, 2004) and is capable of forming dense impenetrable thickets in the undergrowth of some forest systems (Meyer, 2004; Oppeheimer, 2007; Williams, 2008) possibly displacing other plant species and altering natural successional processes. It has been shown to be more suited to capturing and using light than native Hawaiian species in greenhouse conditions (Pattison et al., 1998) with its competitiveness thought to be partly responsible for the possible extinction of the endemic Acalypha wilderi on Rarotonga (McCormack, pers. comm., 2000; in Meyer, 2004). Like all Cestrum species, all parts of C. nocturnum are known to be highly toxic either fresh or when dried (Connor, 1977). As such, C. nocturnum forms a risk to livestock with 120 g (approximately 60 leaves) of Cestrum spp. material enough to result in the death of a 400 kg cattle beast (Environment Bay of Plenty, 2003). In humans, C. nocturnum can cause hay-fever like symptoms (Williams, 2008) and while a non-fatal poisoning of a human child was reported by Connor (1977), no poisonings have been reported since 2002 (Williams, 2008) and there have been no records of any fatal poisonings (Connor, 1977; Williams, 2008). Preventative Measures: A Risk assessment of Cestrum nocturnum for Australia was prepared by Pacific Island Ecosystems at Risk (PIER) using the Australian risk assessment system (Pheloung, 1995). The result is a score of 16 and a recommendation of: reject the plant for import (Australia) or species likely to be of high risk (Pacific). In New Zealand C. nocturnum has been included in the Auckland Regional Pest Management Strategy as a \"Research Organism\" and as such there are no rules or regulations restricting their propagation and growth (ARC, 2007). It has not been included in the National Plant Pets Accord, primarily due to a lack of information on current distribution and potential effects (Biosecurity New Zealand, 2010). 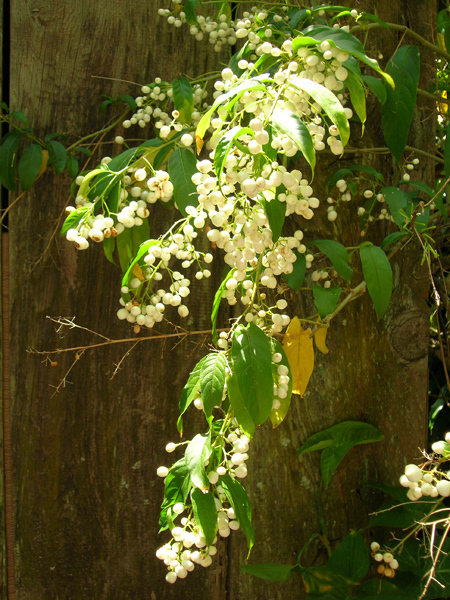 While not included in any other Regional Pest Management Strategies, C. nocturnum is apparently prohibited from sale in the Northland Region (Williams, 2008) and Cestrum spp. in the Bay of Plenty Region have been prohibited from propagation, sale and distribution (Environment Bay of Plenty, 2010). Physical Control: Small plants can be hand pulled all year round and left on site to rot down (Weedbusters, 2010). As stems can resprout and reinfestation can occur through the seed bank, bared sites should be replanted to prevent regrowth (Weedbusters, 2010). Chemical Control: Good control results for C. nocturnum have been reported using triclopyr ester at 20% in crop oil applied basal bark (Katie Cassel, pers. comm. ; in Motooka, et al., 2003) with C. nocturnum probably sensitive to foliar application of triclopyr (Motooka et al., 2003). Cutting and painting the cut surface with a herbicide solution can be done all year round (Weedbusters, 2010) with Environment Bay of Plenty (2010) recommending the use of one part Tordon Brushkiller to 20 parts of water (50 ml / L), and Weedbusters (2010) recommending 100 ml / L of Tordon Brushkiller, 100 ml / L of triclopyr 600 EC or 500 ml / L of Yates Hydrocotyle Killer. Larger infestations should be sprayed (Environment Bay of Plenty, 2010), ideally in spring or summer (Weedbusters, 2010) with Environment Bay of Plenty (2010) suggesting the use of 50 ml of Tordon Brushkiller in 10 L of water and Weedbusters (2010) recommending the use of triclopyr 600 EC (30 ml/ 10 L) or Yates Hydrocotyle Killer (15 ml / L). Informations on Cestrum nocturnum has been recorded for the following locations. Click on the name for additional informations. Environment Bay of Plenty. 2010. Weed index result. Solanaceae. Motooka, P., Castro, L., Nelson, D., Nagai, G., & Ching, L. (2003). Weeds of Hawaii s pastures and natural areas: an identification and management guide. College of Tropical Agriculture and Human Resources (University of Hawaii-Manoa), Honolulu. Cestrum nocturnum. Space, J.C., & Flynn, T. (2000). Report to the government of Niue on invasive plant species of environmental concern. U.S.D.A. Forest Service. Biosecurity New Zealand. (2010). Technical Advisory Group Assessment of National Pest Plant Accord Species. de Carvalho Soares, Edson Luis; Vignoli-Silva, Marcia; Mentz, Lilian Auler, 2007. The Cestrum L. (Solanaceae) genus of Rio Grande do Sul, Brazil. Pesquisas Botanica.(58). 2007. 263-282. Environment Bay of Plenty. 2003. Poisonous Plants. Fact Sheet 19. Summary: Available from: http://www.envbop.govt.nz/Factsheets/PestPlants-030815-Factsheet19PoisonousPlants.pdf [Accessed July 16, 2010]. Florence J., Chevillotte H., Ollier C. & Meyer J.-Y. 2007. Cestrum nocturnum Base de donn�es botaniques Nadeaud de l Herbier de la Polyn�sie fran�aise (PAP). Fosberg, F.R. (1955). Northern Marshall Islands expedition, 1951-1952. Land biota: vascular plants. Atoll Research Bulletin, 39. ITIS (Integrated Taxonomic Information System), 2008. Online Database Cestrum nocturnum L.
Meyer, Jean-Yves, 2004. Threat of invasive alien plants to native flora and forest vegetation of eastern Polynesia Pacific Science. 58(3). July 2004. 357-375. Negi, P.S., & Hajra, P.K. (2007). Alien flora of Doon Valley, Northwest Himalaya. Current Science, 92(7), 968-978. Oppenheimer, H.L. (2007). 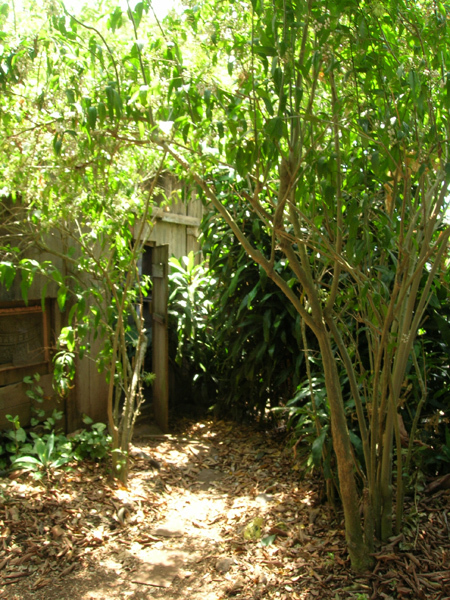 New plant records from Moloka�i, Lana�i, Maui, and Hawai�i for 2006. In: Evenhuis, Neal L. and Eldredge, Lucias G., (eds.) Records of the Hawaii Biological Survey for 2006. Part 2: Notes. Bishop Museum Occasional Papers 96: 17-34. Oppenheimer, H.L., & Bartlett, R.T. (2000). 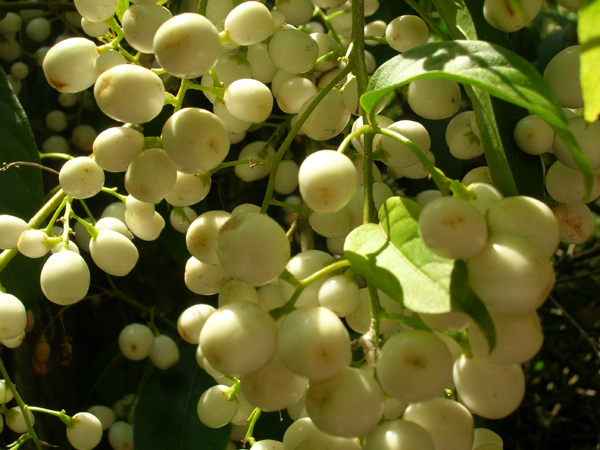 New plant records from Maui, O�ahu, and the Hawai�i Islands. In: Evenhuis, Neal L. and Eldredge, Lucius G., (eds.) Records of the Hawaii Biological Survey for 1999. Part 2: Notes. Bishop Museum Occasional Papers. 64: 1-10. Pattison, R.R., Goldstein, G., & Ares, A. (1998). Growth, biomass allocation and photosynthesis of invasive and native Hawaiian rainforest species. Oecologica, 117, 449-459. Space, James C. and Marjorie Falanruw, 1999. Observations on invasive plant species in Micronesia. Prepared for the meeting of the Pacific Islands Committee, Council of Western State Foresters, Majuro, Republic of the Marshall Islands, February 22-26, 1999. Space, James C. and Tim Flynn, 1999. Observations on invasive plant species in American Samoa. Space, J.C., & Flynn, T. (2001). Report to the Kingdom of Tonga on invasive plant species of environmental concern. U.S.D.A. Forest Service. Space, J.C., & Flynn, T. (2002b). 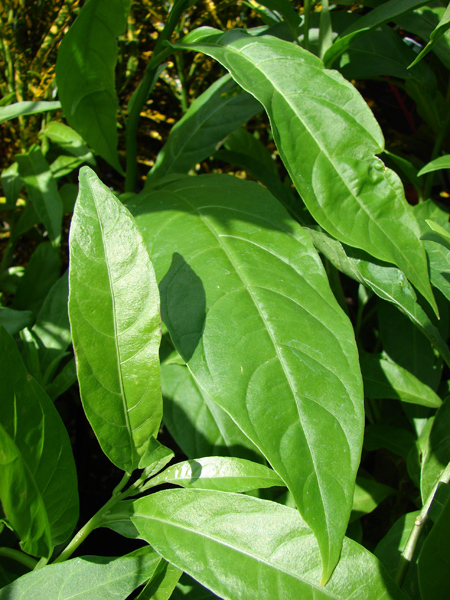 Report to the government of Samoa on invasive plant species of environmental concern. U.S.D.A. Forest Service. Space, J.C., & Flynn, T. (2002). Report to the government of the Cook Islands on invasive plant species of environmental concern. U.S.D.A. Forest Service. Starr, F., & Martz, K. (1999). Botanical survey of Midway Atoll 1999 update. Midway Atoll National Wildlife Refuge. Starr, F., Starr, K., & Loope, L.L. (2003). New plant records from the Hawaiian Archipelago. In: Evenhuis, Neal L. and Eldredge, Lucius G., (eds). Records of the Hawaii Biological Survey for 2001-2002. Part 2: Notes. Bishop Museum Occasional Papers. 74:23-34. Starr, F., Starr, K., & Loope, L.L. (2005). Roadside survey and expert interviews for selected plant species on Molokai, Hawaii. USDA, ARS, 2010. Taxon: Cestrum nocturnum L. National Genetic Resources Program. Germplasm Resources Information Network - (GRIN) [Online Database]. USDA, NRCS. 2010. Cestrum nocturnum L. night jessamine. The PLANTS Database. National Plant Data Center, Baton Rouge, LA 70874-4490 USA. Velde, N.V. (2003). The vascular plants of Majuro Atoll, Republic of the Marshall Islands. Atoll Research Bulletin, 503. Waitakere City Council. (2006). Waitakere City parks roadside five year work programme. Webb, C. J., Sykes, W.R., & Garnock-Jones, P.J. (1988). Flora of New Zealand Volume IV; Naturalised Pteridophytes, Gymnosperms, Dicotyledons. Christchurch, Botany Division, D.S.I.R. Williams, P.A. 2008. Biological success and weediness of some terrestrial weeds not presently in the Northland Regional Council s RPMS. Landcare Research Contract Report. Woodcock, D. (2003). Restoring the watersheds: early twentieth-century tree planting in Hawai i. Annals of the Association of American Geographers, 93(3), 624-635. Zhang, Z., Lu, A., & D Arcy, W. (1994) Solanaceae. Flora of China, 17, 300�332.